Welcome to our online casino review of GunsBet, a Wild West-themed gambling destination that has a diverse footprint in iGaming. The casino accepts and caters specifically to players from Australia, Russia, Canada, Norway, Sweden, Poland and New Zealand. The casino also supports USD deposits so if you are from a country that Gunsbet doesn’t support specifically you can deposit and display your balance in US dollars. New players at Gunsbet receive a 100% deposit bonus up to the value of $/€100 and you will also receive 100 free spins on selected slots games. There is a minimum deposit amount which varies from country to country to trigger the bonus offer. The maximum bonus also changes from country to country with the one consistent thing being that it will be matched by 100%. You can view the bonus offer available to people in your country in the graphic above with it geo-targeted. If you deposit bitcoin you will receive up to 0.005 BTC matched plus any winnings after the completion of the free spins. Use the bonus code: BONUS100 to trigger the matched deposit and free spins bonus, however it will be applied automatically by following our links. Like all online casino bonuses there are some requirements that must be met to withdraw any winnings that you might have. These include a 50x turnover requirement on both the deposit bonus and any winnings accrued from the free spins. The free spins will be issued in 20 lot increments over a five day period. There is also a maximum bet limit when you are playing with your bonus money. Gunsbet.com has got games from a multitude of software developers, although not every game will be available to every country. This is because some iGaming software providers will not operate in non-regulated markets; with an example of this being Microgaming and no being available in Australia. This doesn’t mean you can’t play any games it simply means you won’t have as many games as players who are in a country with laws that are deemed in the “grey area” of online gambling. At Gunsbet you will find slots games from many different providers including Microgaming, EGT, Betsoft, NetEnt and Nyx Interactive which have some of the most recognisable titles in the industry, including the big progressive jackpots from Microgaming, which can go int0 the 10s of millions of Euros. GunsBet.com also has the full suite of EGT and iSoftBet progressive slots games which means players from Australia and other countries with strict gambling laws can still play. The table limits for the live dealer section of GunsBet suit both the high-roller and those with a smaller bankroll, with table limits ranging anywhere from $0.50 cents per hand or spin right up to $5000, although these limits do vary from game to game. GunsBet.com is fully responsive so it will work on both computers and mobile devices. You will find that some browsers like Google Chrome will work better than others like Safari. If you are struggling to load some games switch up the browser and with a bit of trial and error everything, including mobile live games, should work. 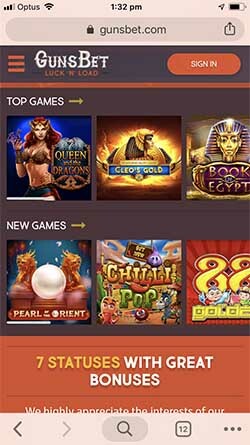 The casino does have more games on desktop than mobile, but this is pretty standard across the industry. The same goes for the banking section, with more options available on desktop, however the most popular banking methods in each country do tend to be available on mobile. GunsBet.com is a great option for those players in countries like Australia and Russia, where the gambling laws surrounding online casinos are strong. If you are from a country like New Zealand there are better options available that have licensing from the likes of the UK and Malta’s regulatory arms. One of the highlights of the casino is the live dealer section, so if that is what you are looking for, Gunsbet Casino comes up trumps. The bonuses the casino does provide are well worth your time and as one of the few decent gambling sties with a bitcoin offer it has a unique edge not found at some casinos.